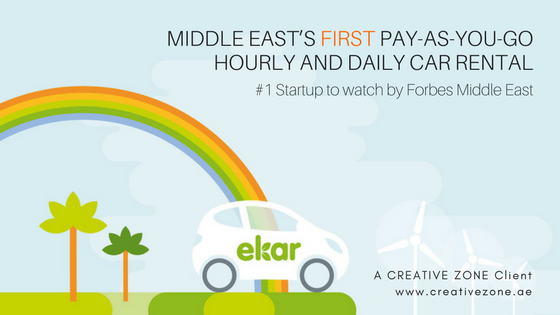 CREATIVE ZONE is proud to announce that EKAR, our client, is one of the competitors in the GITEX Future Stars - Middle East and Africa's largest startup confluence of global tech entrepreneurs, international investors and influential corporate buyers. Dubai commuters from any location can now pick up and drop a car anywhere in Dubai with the option of paying by the minute, daily, weekly, or monthly basis. Ekar is an easy-to-use car sharing service that allows people to book cars easily anywhere in the city in the comfort of your laptop or smartphone. Recently, Ekar and RTA signed a deal as part of initiative of RTA’s last mile solutions, providing commuters independent and flexible options at a reasonable rate. "We like to present this as a car sharing system, which requires membership. The registration is very simple and the application is processed within an hour. There is a monthly charge of Dh20 for members, which will allow them to access our vehicles from a almost all the metro stations in the city,” said Vilhelm Hedberg, CEO of ekar. Watch Vilhelm Hedberg, Co-Founder and CEO of Ekar as he explains more about how Ekar works. UAE is the destination of choice when it comes to launching startup companies. According to Muhammed Mekki, founding partner of Astrolabs, with over 2 billion people living within a four-hour flight radius and the right infrastructure to support a thriving start-up ecosystem, Dubai is a compelling location to consider for founders from around the world. More and more tech and AI based startups are investing in the country and setting up a company in Dubai and across the UAE is becoming easier especially with the help of the industry professionals like CREATIVE ZONE. We have helped over 5,000 startups and companies setup and expand their businesses in the country. From Free Zone, Dubai Mainland (LLC) to Offshore business setup, we have a dedicated team of company registration professionals ready to assist you. From activities like E-Commerce, Events Management, IT Consultancy, Real Estate, Facilities Manageent, Media and Marketing and more. We have a team of over 105 qualified professionals who speak 12 different languages across Operations, Sales, Marketing, PROs and Finance department. At CREATIVE ZONE, we provide dedicated support from startup and for the lifetime of your business. Talk to one of our Business Setup Advsiors about banking in Dubai, UAE residency and company formation today. Ask about out current promotion. Call +9714 567 7333 or live chat with us today.